Osaka rounded out our three city 'whistle-stop' one week trip around Japan by train. Osaka is just a short train ride (about 30 minutes on the rapid JR line) from Kyoto but makes an ideal home base because (a) it's less touristed and thus cheaper to stay than Kyoto (b) there are a variety of compelling day trips that are possible while staying in Osaka. Here are the Top 5 experiences we had on our trip while based in Osaka. 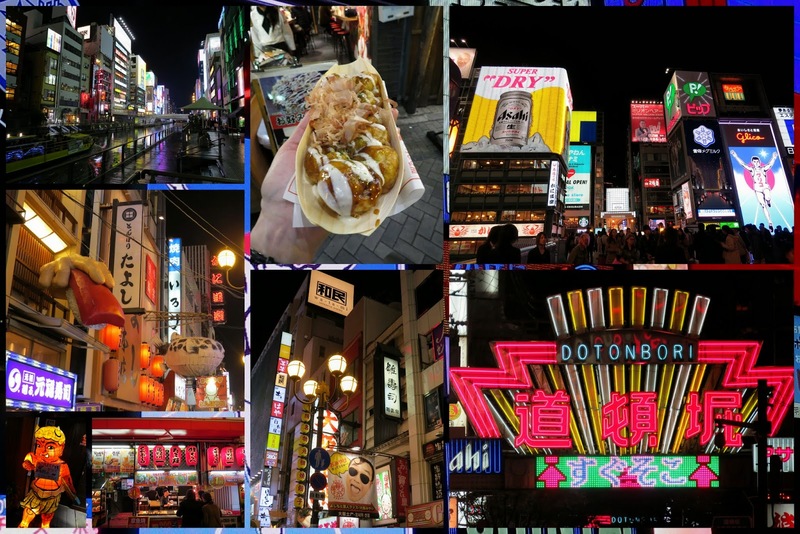 Dotonbori is all bright, shiny lights; shops; and street food positioned along the river in Osaka. Throngs of people come out at night for drinks and to sate their appetite. We nearly burned our faces off when we tried takoyaki (octopus dumplings) fresh off the grill (so HOT). We also learned that Dotonbori is a popular destination for American expats as there is a military base nearby. This is when the military folks come when they are on leave. A young American Navy man saw us on the street (no surprise that westerners stand out in Japan) and came over to introduce himself and welcome us to the city. A nice touch. He gave us one important tip. Japanese people love to queue so when looking for street food, always pick the place with the longest line. Osaka has what seems like miles of covered shopping arcades running through the heart of the city. We arrived on a rainy day and it was a welcome diversion to go inside and window shop a bit. 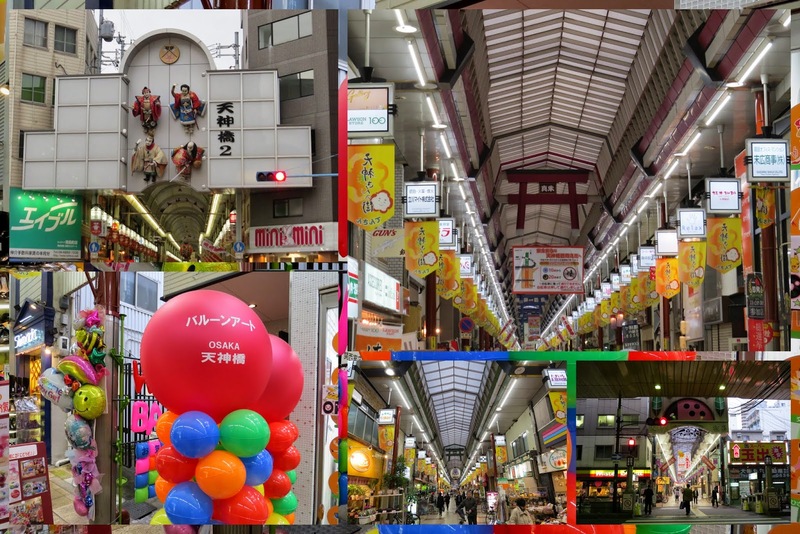 The Namba walk (located near Dotonbori) also offers an amazing array of underground shops spanning the distance between two train stations. 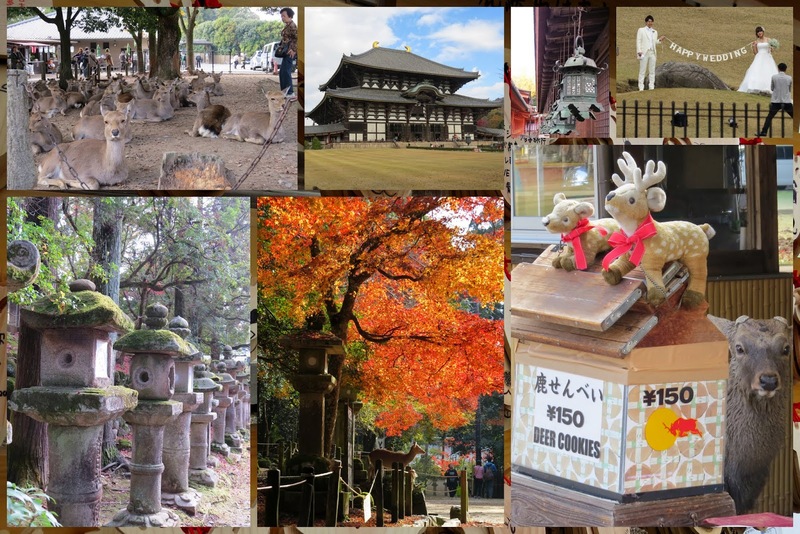 Nara is an easy day trip from Osaka and features stunning temples in the forest on the outskirts of town. Massive herds of deer stake out the most touristed spots hoping to be fed a 'deer cookie'. Some of the deer seemed smarter than others. We saw a couple of fellows staking out a spot right in front or even behind the vendors. We also saw some spectacular Autumn foliage and even a happy couple getting married. As we were wandering back toward the train station in Nara we saw a sign for the Naramachi Mechanical Toy Museum. Why not? We entered a traditional home built over 100 years ago that had been converted to a museum. We took off our shoes and stepped up onto the tatami mats. Each toy was a delight to behold and while the 'curator' didn't speak very much English, she demoed the toys with gusto (some flew, some climbed, some jumped). 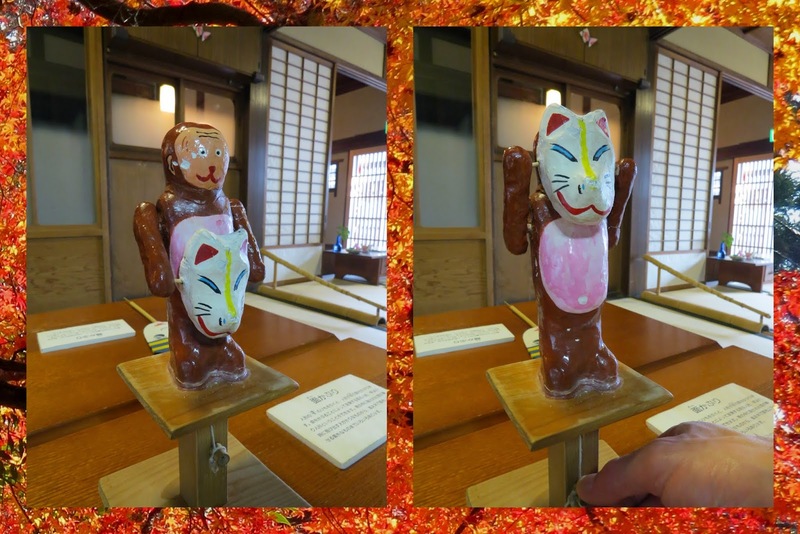 I liked this little monkey that donned and doffed a mask when you pulled on a string. I always recommend saying 'why not?' when you pass a place that interests you that you didn't know about. You never know what delightful experiences might be in store. 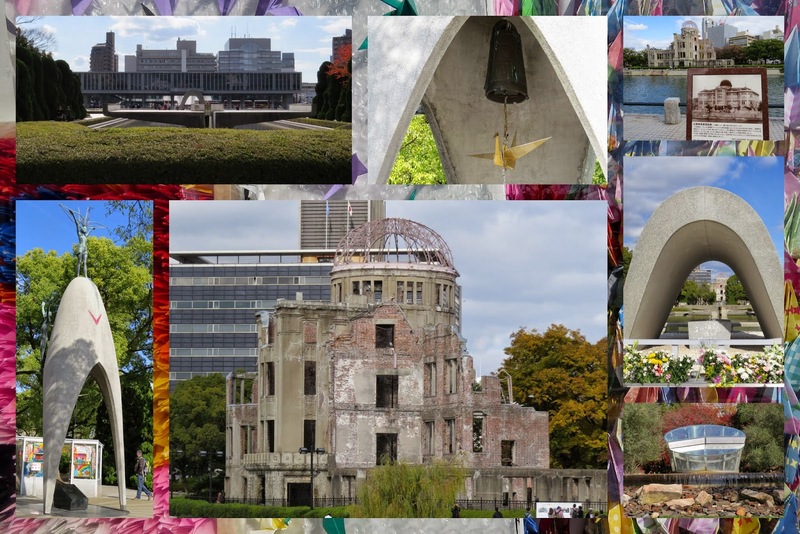 Hiroshima is another easy day trip from Osaka and we felt compelled to go despite the difficult past that it represents between the US and Japan. Hiroshima was ground zero when the U.S. dropped the first atomic bomb on Japan in an attempt to win World War II. In total, 200,000+ lives were lost in the short term but millions more would likely have died if a ground invasion had been required. Everything was flattened for a 2 km radius save one building whose shell still remains as it was on that day as a constant reminder of the ravages of war. The museum nearby does a very subtle and objective job of telling the story. It presents artifacts that were recovered in the aftermath of the bomb and each tells a story of the person who once owned it. The most touching for me was a rusted tricycle that belonged to a 3 year old boy who died within a few days of the blast. The museum also spends time laying out the health effects and what happened to those exposed to the radiation from the blast. After touring the museum, it's a relief to walk quietly through the Peace Memorial Park outside. Thousands of folded paper cranes in the park represent a lasting wish for peace. It is a lovely spot for quite reflection as the modern city of Hiroshima careens by going about its business beyond. 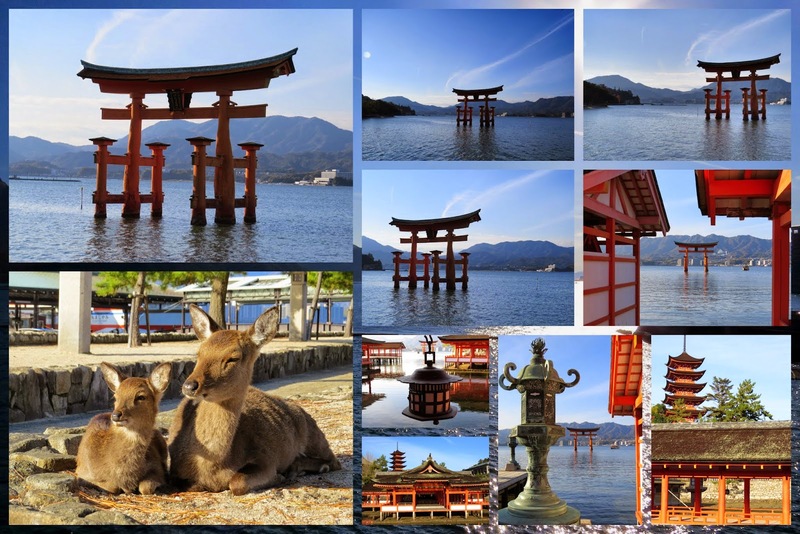 Miyajima Island is another haven of tranquility a short train ride from Hiroshima. We took the local train and ferry using our JR Rail Pass. We could soon see the iconic torii gate looming in the water with the current lapping slowly against its base. We slowly and mindfully explored the temple. It was a sunny day and just like Nara, there were plenty of deer about enjoying the sunshine. Miyajima is also known for its maple leaf shaped momiji manjū (steamed sweet cake). Traditionally, these cakes are filled with bean paste but in Miyajima a whole industry has cropped up around this and we collected all manner of flavors including cream, chocolate, green tea, pumpkin, and many more. I'm a collector by nature and insisted on buying at least one of every flavor (they cost less than the equivalent of 1 USD each) to bring home. Let the memories live on! 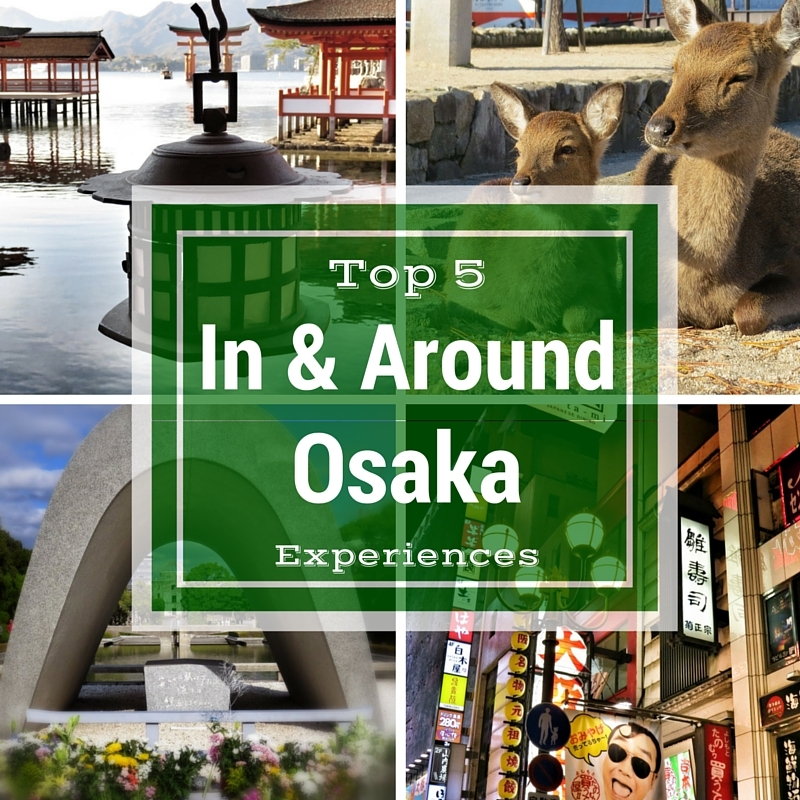 What other sights and experiences do you recommend with Osaka as a home base? 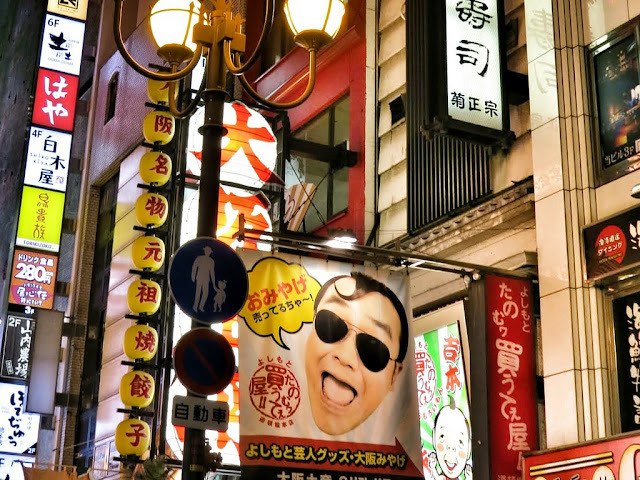 Cory from You Could Travel blog published a list of her favorite things to do in Osaka. Check it out. Find out what to do in Osaka Japan on vacation. 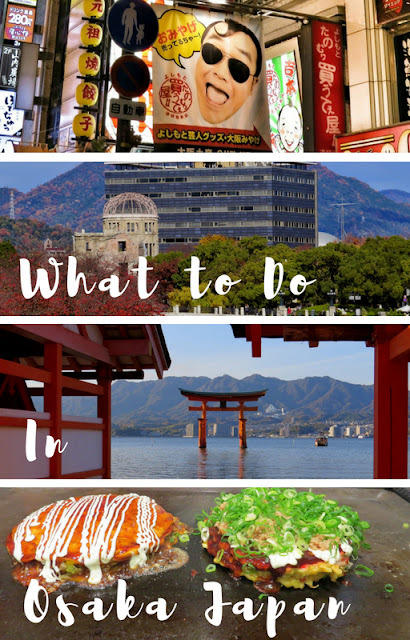 Take a phototour of things to see around Osaka including Dotonbori, Nara, Hiroshima, and Miyjima Island.